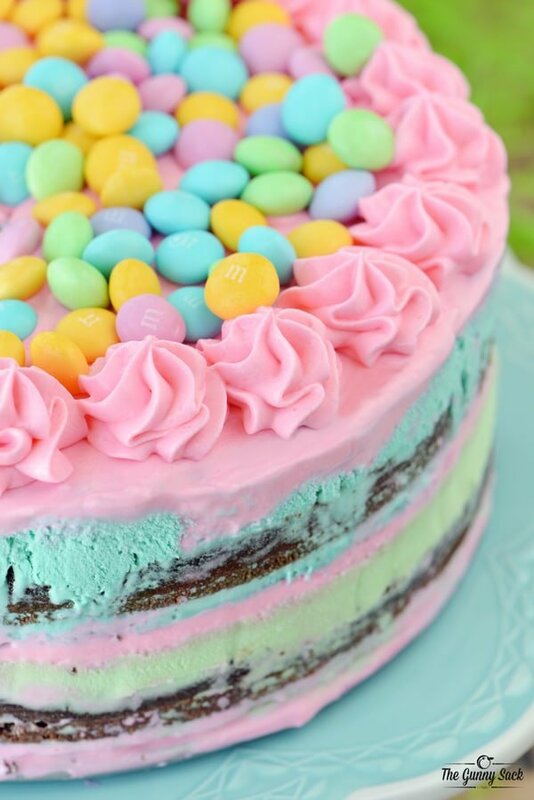 This M&M Ice Cream Cake is perfect for spring! 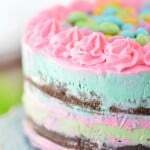 Try this ice cream cake recipe for Easter, Mother’s Day, a baby shower or a girl’s birthday party. Can you believe that Easter is next weekend? My kids are on their spring break, the weather is warming up and we are loving every minute! I took a little time at the end of last week to put together some gorgeous Easter baskets and I made an M&M Ice Cream Cake that is perfect for Easter. I found everything I needed, for both the cake and the Easter baskets, at Target! 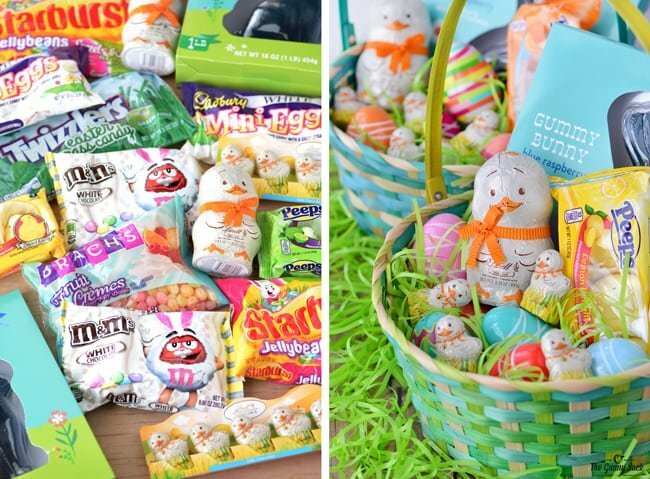 There were aisles of fantastic Easter candy, baskets and goodies at Target. I love shopping at Target for all of my holiday needs. I know that I am getting a great value and they have everything I want. 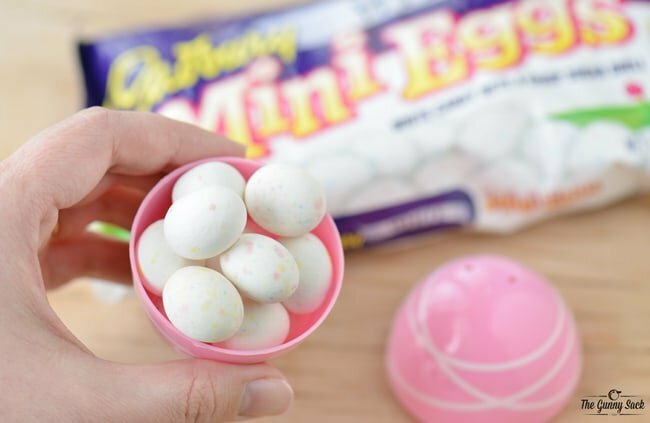 Some of this Easter candy is sold exclusively at Target! I picked up a couple Spitz Easter bamboo baskets in my kid’s favorite shades of green and blue. Then, I found some adorable Spitz multi-print Easter eggs and I knew they would look cute in the baskets. The Lindt Chocolate Chicks are the star of the Easter basket because they are so cute. Since they are wrapped, I didn’t put them in plastic eggs. 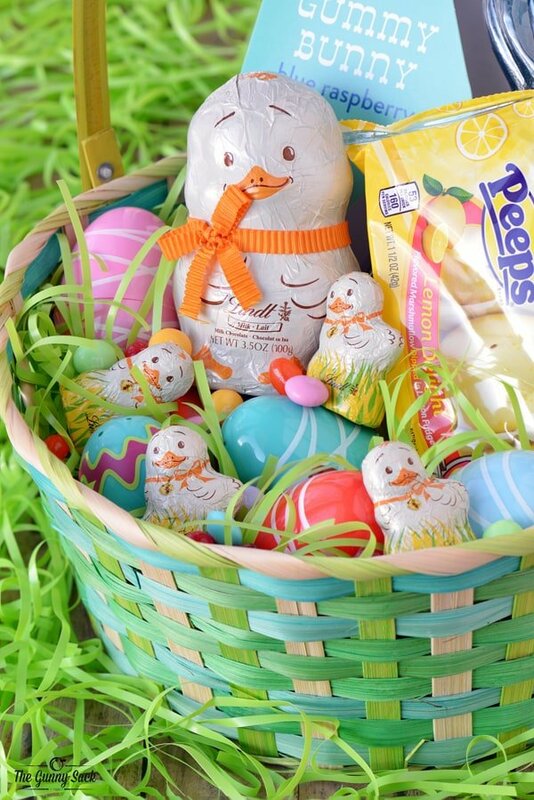 I added the large Lindt Milk Chocolate Chicks, as well as the Lindt Little Chocolate Chicks to the baskets. My kids are going to love the blue raspberry Gummy Bunnies and the Peeps Orange, Lemon and Lime Delight. Christine recently moved out of state (I can’t believe she is old enough), but I wanted to give her some Easter goodies anyway. 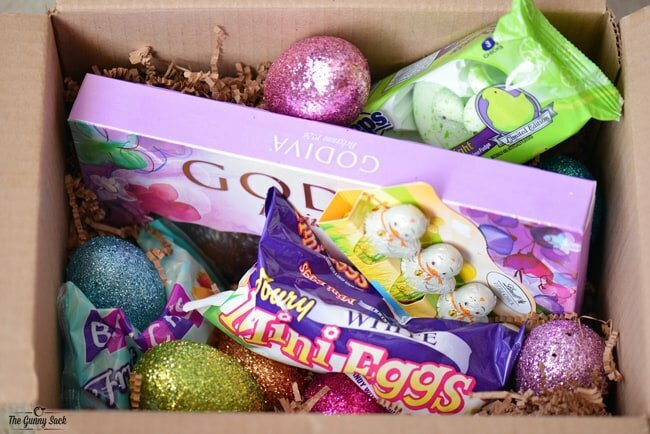 So, I assembled a box of Easter treats that I can mail to her. In addition to a Godiva Dark Chocolate Bunny, I added full bags of Easter candy for her to share with her roommates. Christine has always loved glitter and I found some sparkly Easter eggs to put with the filled plastic eggs. Once the Easter baskets were full, I started working on the M&M Ice Cream Cake. I bought the ingredients for the cake from Target Grocery. Start by making two chocolate layer cakes. I baked the cakes in 9-inch KitchenAid springform pans. I used one of the pans to assemble the ice cream cake. After the ice cream cake has frozen overnight, quickly frost it with pink whipped cream frosting. Then, remove most of the pink frosting from the sides. The pink frosting will fill in the cracks. Put the ice cream cake back in the freezer to harden. Once the pink frosting is firm, fill a pastry bag fitted with a large star tip (you can find the Wilton Cupcake Decorating Kit in the baking aisle at Target), with pink whipped cream frosting. Pipe pink swirls around the top edge of the cake and fill the center with white chocolate M&Ms. Store the layered ice cream cake in the freezer until ready to serve. Dip a large knife in hot water, dry it off and then cut the cake, re-dipping in hot water, as needed. This M&M Ice Cream Cake is such a fun way to celebrate the holiday. Thanks to Target, we have the ultimate Easter baskets, a delicious M&M ice cream cake and we are ready for Easter! Grease and flour the pans and then line the bottom with parchment paper. Melt unsweetened chocolate in the microwave and stir in the sugar. Beat in the eggs, oil, buttermilk and vanilla. Alternately add the hot water and flour mixture, beat until smooth. Bake at 325 degrees for 30-35 minutes until a toothpick inserted in the center comes out clean. Cool the cakes for 30 minutes in the pan, on a wire rack. Remove the springform pan sides, peel off the parchment paper and allow the cakes to cool completely on the wire rack. Once the cakes are cool, use a large serrated knife to cut off the domes. 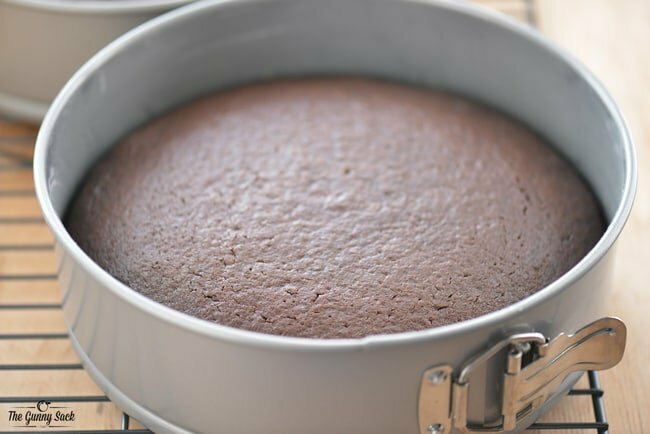 Line the outside of the pan with parchment paper and place one cake in the springform pan. Tint 3 cups of vanilla ice cream with green food coloring. Working quickly, spread the ice cream over the cake in the pan. Then, the other cake layer and top it with aqua tinted ice cream. Put the ice cream cake in the freezer to harden overnight. Before removing the ice cream cake from the freezer, make the whipped cream frosting. In a chilled bowl, beat heavy cream until soft peaks form. Add 1 cup of powdered sugar and whip until stiff peaks form. Set the whipped cream aside. Beat the softened cream cheese, marshmallow cream, 1 cup of powdered sugar and vanilla until smooth. Fold into the whipped cream. Tint the whipped cream frosting with pink food coloring. The next steps need to be done as quickly as possible, because as soon as the ice cream cake comes out of the freezer, the ice cream will start melting! Take the ice cream cake out of the freezer, remove the springform pan ring and peel off the parchment paper. 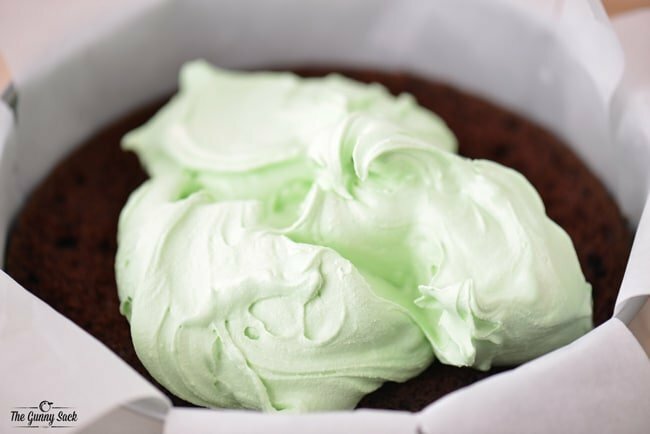 Quickly cover the top and sides with the whipped cream frosting. 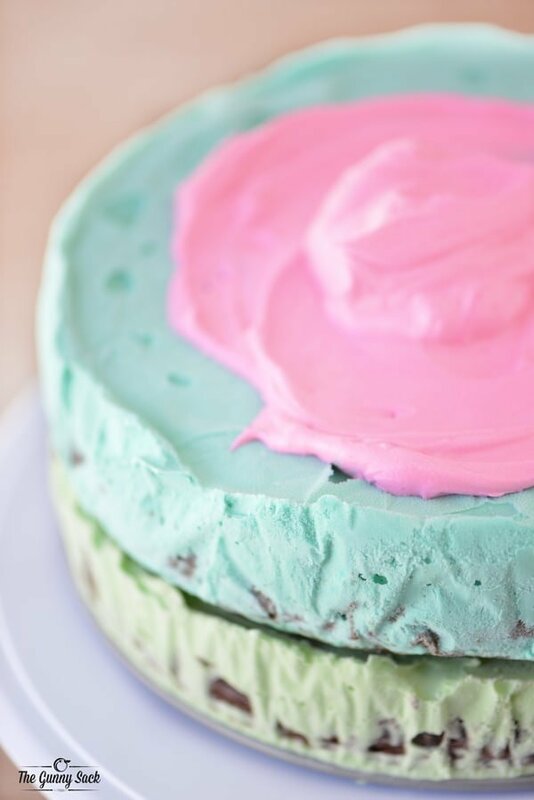 Then, use an offset spatula to remove most of the pink frosting (as well as some of the green and blue ice cream, if necessary) from the sides of the cake. You will still be able to see the pink frosting in the cracks. Put the cake back into the freezer for an hour or two, to harden. Store the whipped cream frosting in the fridge. Once the pink frosting is firm, fill a pastry bag, fitted with a large star tip, with pink whipped cream frosting. Pipe pink swirls around the top edge of the cake and fill the center with white chocolate M&Ms. Used a box cake mix and pistachio ice cream for the green layer. Cake looked very nice and did taste ok, but the cake didn’t thaw before the ice cream began to run. Or the ice cream ran all over by the time the cake was thawed. Cake was still cold so was dry and not very tasty. Maybe that was because it was a box mix. M&Ms were hard as rock no matter how long we left the cake to thaw. This was a “one time only” recipe. Not worth all the steps and time it took to put together. The frosting was GREAT and will use that again! Hi im not sure if this has been asked. The pink cream topping. How long can that be frozen for? I’m wondering about a day before using and if not eaten at first sitting. As I was looking for a topping for just an ice cream cake. Thanks so much. I was thinking a 3 tier with 3 different flavours of ice cream. Maybe a cookie cumble inbetween layers? And idea for inbetween layers? But I’ve been looking for a yummy topping to cover sides and top. I may do the day before or 2 days before. I am hoping to make this cake for my brother’s birthday. How does the cake portion work in the freezer? I would have thought the cake would turn rock solid in the freezer. How do you get around this? Any tips would be great! I’m not a very experienced baker haha. been making ice cream cakes for years and my advice is to scrimp on the ‘cake’ portion (maybe just use it as a base). frozen cake isn’t that much of a treat! i have a questions about the ice cream portion of the recipe. How long did you let your ice cream thaw before you were able to mix the coloring well? What type of food coloring did you use: liquid, gel or paste? Will the ice cream be melted enough to coat the sides or did you do that yourself? My freezer isn’t set very low so my ice cream is fairly soft to being with. Depending on our freezer, it will take 10-15 minutes at room temp. Also, I used my mixer to do the mixing rather than doing it by hand. The food coloring I used is Wilton Gel. The ice cream ran down the sides itself and the pink color came from the pink whipped cream frosting. Best of luck! The cake is in the freezer and I’m ready to make the frosting but don’t see the cream cheese in the directions. Should that be cream cheese in step 3? Thanks! Sorry about that! I’m on vacation in an area with limited internet access. Yes, you should add the softened cream cheese in step 3. Best of luck! This looks absolutely beautiful!! 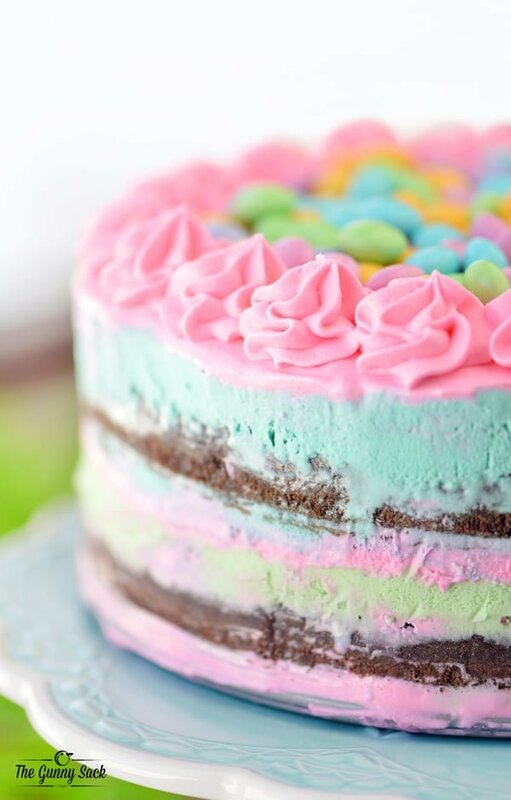 Love the colors, love that it’s ice cream cake. Just beautiful! Happy Easter! I can’t tell you how much I absolutely adore this cake! It is perfection in every possible way and the colors make me happy! Thank you Jocelyn! I am totally in love with all of the spring/Easter colors! I didn’t realize that you are such a talented cake decorator, Tonia! This is absolutely beautiful! Thanks Andi! I can’t say that I am talented yet but I am having fun learning! Beautiful cake, I just love this idea! And yasss, it’s hot enough here that i’d love to cool down with this cake! It is just starting to warm up again, here in Minnesota but they are predicting snow next Monday. We love eating ice cream anyway! You are the queen of BEAUTIFUL cakes! 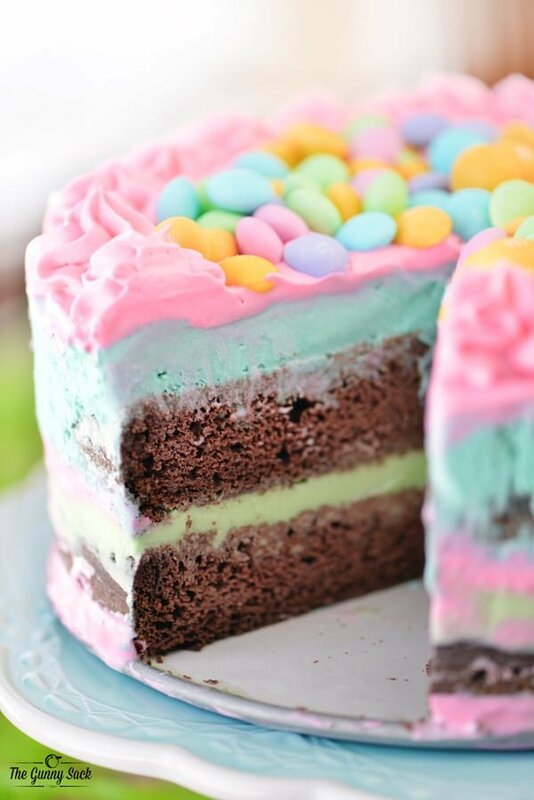 Such a bright and fun cake for Easter! Well isn’t this the most gorgeous Easter cake ever?! I love that it’s ice cream too! Thanks Julianne! 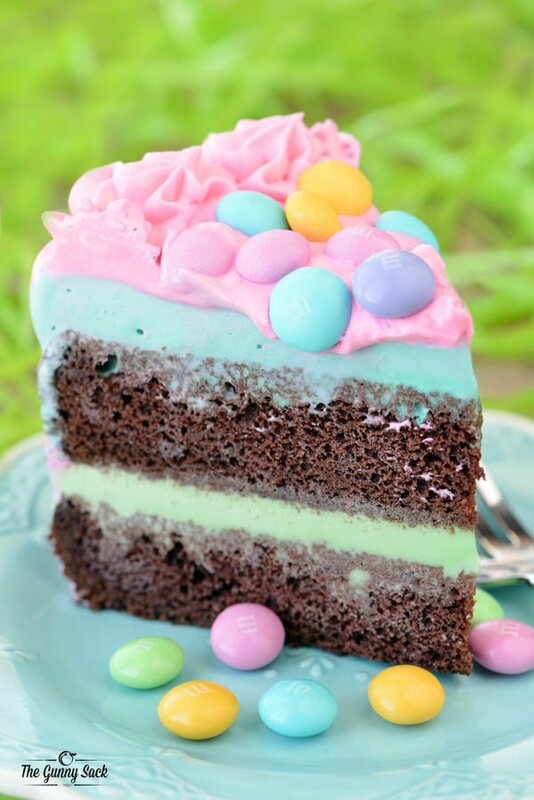 I love all of the Easter colors on the cake! This is so pretty and so perfect! 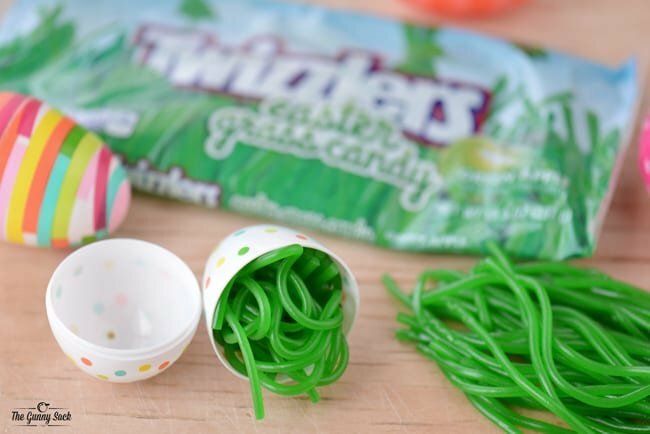 Love it for a fun Easter dessert – or anytime dessert for that matter! Yes, I think my kids are going to request this as a birthday cake! Thanks Hayley! I need to echo the rest of the comments and pipe in about how BEAUTIFUL this cake is!! That’s amazing! Thanks Nicole! It was fun to share with my nieces and nephews! First off, you are the best mom ever for mailing an easter basket! And second, this cake is GORGEOUS!! Thanks Beth! I wonder if she reads my blog. I know she looks at it, but I figured she was probably too busy to look too closely. I can’t wait for her to get it! What a cute idea for Easter! The cake looks awesome and the decorations are delicious ;). My kids would love this on Easter morning! Thank you for sharing! This looks amazing! 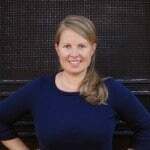 I am pinning for later since the kids are out for Spring Break. This is a great cake to take to the kids class! This is the prettiest ice cream cake I’ve ever seen! Love this idea! I seriously do not know which I like better, the cake or the baskets. They are so amazing!! Our targets are closing here in Canada but I was able to score some Easter items on sale. I am sad they are leaving because I do enjoy their products. I’m stunned into silence by how gorgeous this is…just wow! Seriously, best mom ever award goes to you not only for that beautiful cake, but also for those killer Easter baskets!! This is one of the prettiest cakes ever!!! 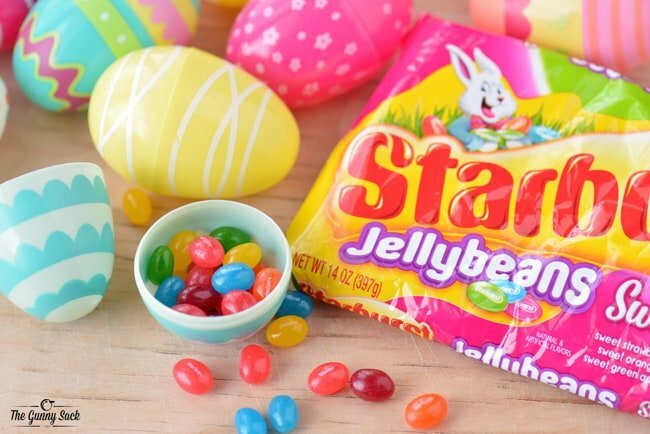 I love all the colors and all of the fun Easter treats! What a gorgeous cake! I love all the colors. I Love Target also! Your cake is perfect!